I never thought that changing diapers would make me feel like a superhero. Yes, I wake up in puddles at night — if I ever get to sleep in the first place. Yes, sometimes I'm a little sore. And yes, learning how to breastfeed was probably the hardest thing I've ever done (read the story here). So dirty diapers are okay in my book, especially now that our son has learned he doesn't have to scream his way through changing time. Why Use Baby Bottom Balm For Cloth Diapers? For the first few days after our son's birth, we used plain olive oil to moisturize his bottom and help clean the meconium off more easily. The downside? Straight olive oil is hard to apply, and because it's liquid, can make a mess. Then we bought a tub of this baby bottom balm. It worked super well and includes healing herbs — but it's a lot of money for a teensy 2 ounces! 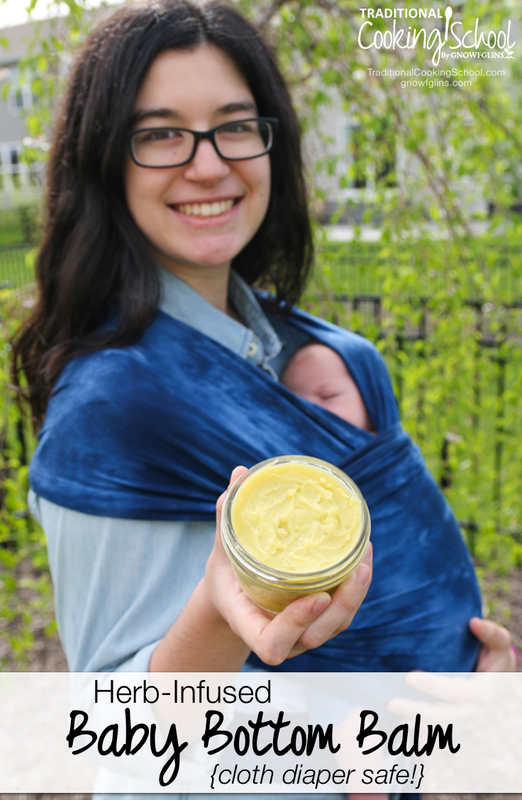 So instead, I bring you this DIY baby bottom balm! I actually like it better than the balm we bought since it stays on our baby's skin better. It's solid but melts onto your fingers for easy application, full of vitamins thanks to olive oil and shea butter, and includes the healing benefits of herbs like chamomile and calendula. And actually, you can use this balm to soothe and heal skin for the entire family! Want to watch me and my mom make this on video? We are following the recipe below but using lavender herb Go here for Facebook or go here for Instagram. Olive oil is soothing and moisturizing to sensitive baby skin, as well as containing Vitamin E (source). Shea butter is great for rashes and contains Vitamins A and E (source). Beeswax kicks plain olive oil up a notch because it keeps this balm solid at room temperature! In the recipe below, you can adjust the amount based on the temperature and your desired consistency. Use more during the summer or for a balm that stays more solid. Use less in the winter or for a softer balm. The more solid the balm is, the more protective it is because it stays on the skin better. St John's wort relieves pain if diaper rash does happen and is also anti-inflammatory (source). Finally, lavender essential oil is 1 of only 4 essential oils safe for babies under 3 months. It's antibacterial, anti-inflammatory, and antimicrobial. (Source.) If you aren't comfortable using essential oils on your baby's skin, however, feel free to use lavender flowers instead! 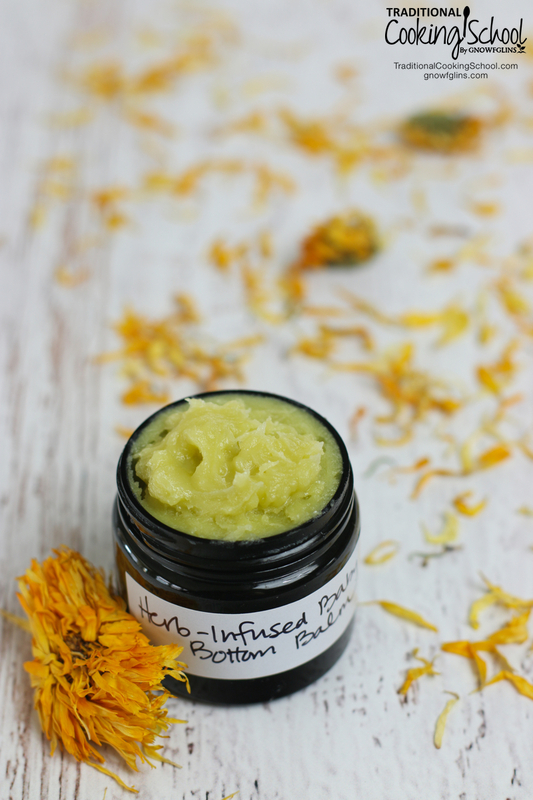 This lovely DIY baby bottom balm is solid but melts onto your fingers for easy application, full of vitamins thanks to olive oil and shea butter, and includes the healing benefits of herbs like chamomile and calendula. And actually, you can use this balm to soothe and heal skin for the entire family! Melt together infused olive oil, shea butter, and beeswax. I used my Instant Pot on the Keep Warm function. Add lavender essential oil (make sure the oils are melted but still relatively cool -- otherwise wait until cooler to add lavender). Before use, rub a small amount of balm on to baby's skin to check for any sensitivity. If no irritation occurs, apply a thin layer of balm to baby's bottom after a diaper change! You may need to rub some in your palm to soften it up before applying. 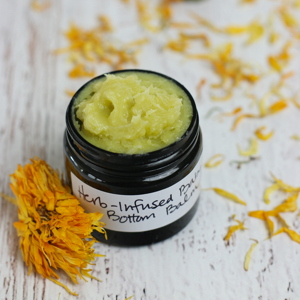 This easy herb infused oil is perfect in my Baby Bottom Balm! You can also use in other bath and skin care products. This yields about 18 ounces, which allows you to make the above bottom balm about 6 times. Combine herbs in a quart-sized jar. Fill to the top of the jar with extra virgin olive oil. Cover the jar and place it in the insert pot of your Instant Pot. Add water until it comes to the level of the oil in the jar. Use the Slow Cook function and adjust time to 3 hours. When it’s done, remove the jar. Strain the herbs out by pouring the oil/herb mixture through cheesecloth-lined colander over a big bowl. 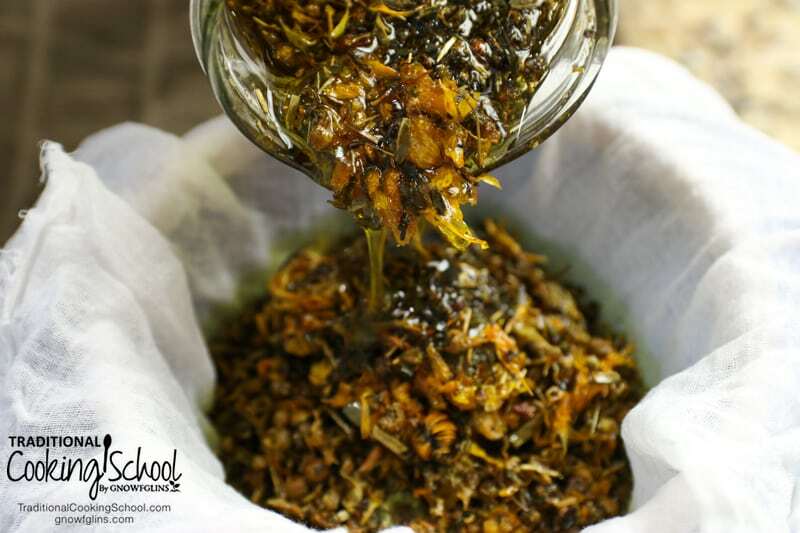 After the first amount of oil drips out, wrap the herbs up in the cheesecloth and squeeze to get even more of the oil out. 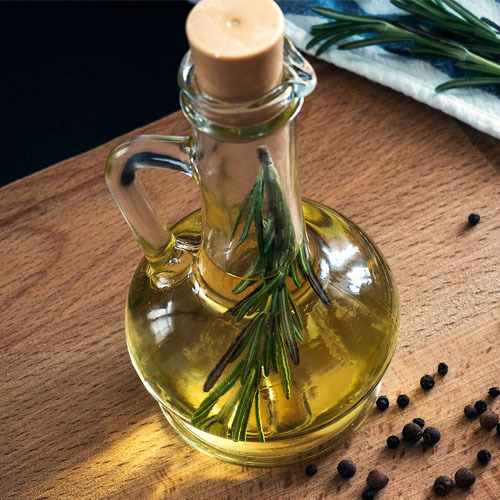 Pour the infused oil into a quart size jar and cap until needed. *Substitute listed herbs for herbs of your choice. 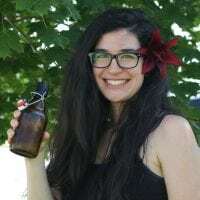 Do you make your own balms and salves? What herbs do you like to use? Haniya, you look so very happy to be a mommy. God bless you for that. This recipe looks really good. Thank you for sharing it. Have a blessed weekend. Thank you so much! I will make this for my baby boy that will be here in October! wow wanna try that! i don’t have an instantpot but can u tell me the alternatives? thanks!